That was just so, so excellent. Absolutely loved the development of really everything. The story and world building was just fantastic. I'm already so hooked and yeesh, I need to keep reading ASAP! Full review as originally posted on The Book Addict's Guide: I had been meaning to read THE NAME OF THE WIND for quite some time and the stars aligned when an Audible deal presented itself at the exact time that I had finished another audiobook. I was really excited to start the book because I’ve been on a fantasy binge lately, I’ve heard such great things, and I’ve heard that the audio is quite fantastic! So how did the read go? In a nutshell… I loved it. Alyssa had told me once that this is one of the characters she’s become heavily invested in and I can easily see why! Kvothe is an outstanding character with a bright personality and a bright mind, and Patrick Rothfuss does an amazing job at bringing the reader into his story. I tend to go into books blind so I picked this one up on the recommendation of others and really hadn’t researched too much what the book was about other than the fact that it was fantasy but I really loved how the book took shape. 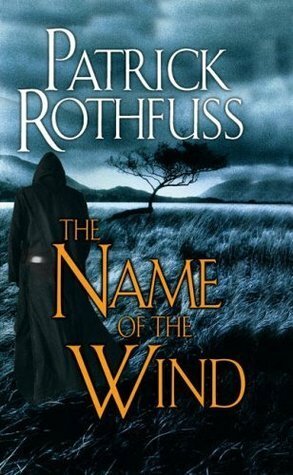 The series isn’t the Kingkiller Chronicles but the Kingkiller Chronicle — one story told over a series of books with THE NAME OF THE WIND starting off in what would be present day for the characters and most of the book taking place in Kvothe’s past, as narrated to Chronicler. I’m not always a fan of the flashback but I really liked how the Kvothe’s youth was the focus of THE NAME OF THE WIND and I suspect we’ll get other portions of his life in subsequent books. I think it’s a great way to really get to know the character instead of just being filled in with bits about his past because his whole life really did shape him to be the person he is now. That being said, THE NAME OF THE WIND still leaves quite a bit for the reader to guess. Yes, we have Kvothe’s history now… But how did he get to where he is now? How did he meet his current comrades? What happened to him to gain this outstanding reputation? We see bits and pieces in THE NAME OF THE WIND and — as agonizing as it is — I’m glad there are so many questions left open because it makes me that much more anxious to continue the series and it also gives the series a sense of continuity instead of being very separate parts. The past is tied into the future and the present hints at the past. It’s really very clever! Really, the whole book is clever. Kvothe has a brilliant mind and sharp tongue and he constantly kept me wholly involved in the story at hand. It was so interesting learning about the magic system as well! There were so many things involved in what one could learn at the university and I’m sure that’s just a drop in the bucket compared to what future books will reveal. There are clever songs, carefully crafted plots, detailed settings, and really just an overall excellent layout to the overall story. I just really enjoyed how an idea was constantly used from start to finish and just when you forgot that it was also a main focus, it would pop back up again in the perfect place. I’m so glad I read THE NAME OF THE WIND! I honestly didn’t want to stop reading and I didn’t want the book to end so I’m definitely planning on reading the next book soon! Since the book spans Kvothe’s youth and time in school, it’s also a really nice place for young adult fans to crossover into a little bit of adult fantasy as well! 15.0% "His parents are just adorable! I love them. Something terrible is going to happen to them, isn't it." 40.0% "I'm so proud of Kvothe! And I just love the character development in this book." 46.0% "!!!! Ambrose. [insert string of expletives here]"
58.0% "Sigh. The "most beautiful girl ever" notion. Please oh please don't get TOO lovestruck."